Mavromoustakos, Thomas; Kellici, Tahsin F (Ed. ): 1824 , Chapter 5, pp. 67-88, Springer Nature, 2018, ISBN: 978-1-4939-8630-9. Bioorganic & Medicinal Chemistry, 2017. European Journal of Medicinal Chemistry, 127 , pp. Pages 531–553, 2016. A comprehensive investigation was performed to identify new benzodiazepine (BZD) derivatives as potent and selective human lysine deacetylase inhibitors (hKDACis). A total of 108 BZD compounds were designed, synthesized and from that 104 compounds were biologically evaluated against human lysine deacetylases (hKDACs) 1, 3 and 8 (class I) and 6 (class IIb). The most active compounds showed mid-nanomolar potencies against hKDACs 1, 3 and 6 and micromolar activity against hKDAC8, while a promising compound (6q) showed selectivity towards hKDAC3 among the different enzyme isoforms. An hKDAC6 homology model, refined by molecular dynamics simulation was generated, and molecular docking studies performed to rationalize the dominant ligand-residue interactions as well as to define structure-activity-relationships. Experimental results confirmed the usefulness of the benzodiazepine moiety as capping group when pursuing hKDAC isoform-selectivity inhibition, suggesting its continued use when designing new hKDACis. Journal of Chemical Information and Modeling, 56 (1), pp. 54-72, 2015. Molecular docking is a widely used technique in drug design to predict the binding pose of a candidate compound in a defined therapeutic target. Numerous docking protocols are available, each characterized by different search methods and scoring functions, thus providing variable predictive capability on a same ligand-protein system. To validate a docking protocol, it is necessary to determine a priori the ability to reproduce the experimental binding pose (i.e. by determining the Docking Accuracy, DA) to select the most appropriate docking procedure, and thus estimate the rate of success in docking novel compounds. As common docking programs use generally different RMSD formulas, scoring functions and format results, it is both difficult and time consuming to: consistently determine and compare their predictive capability to identify the best protocol to be used for the target of interest; extrapolate the binding poses (i.e. Best- docked (BD), Best-cluster (BC) and Best-fit (BF) poses) when applying a given docking program over thousands/millions of molecules during virtual screening. To reduce this difficulty, two new procedures, called Clusterizer and DockAccessor have been developed and implemented for use with some common and “free-for-academics” programs, such as: AutoDock4, AutoDock4(Zn), AutoDock Vina, DOCK, MpSDockZn, PLANTS, and Surflex-Dock to automatically extrapolate BD, BC and BF poses, as well as perform consistent cluster and docking accuracy (DA) analyses. Clusterizer and DockAccessor represent two novel tools, (code available over the internet) to collect computationally determined poses as well as detect the most predictive docking approach. Herein, an application to lysine deacetylase (KDAC) inhibitors is illustrated. Journal of Medicinal Chemistry, in press , 2015.
group in the KDAC active site, providing a further basis for developing new KDACIs of higher isoform selectivity and potency. Journal of Computer-Aided Molecular Design, 29 (8), pp. 757-776, 2015. Vascular endothelial growth factor receptor-2, (VEGFR-2), is a key element in angiogenesis, the process by which new blood vessels are formed, and is thus an important pharmaceutical target. Here, 3-D quantitative structure-activity relationship (3-D QSAR) were used to build a quantitative screening and pharmacophore model of the VEGFR-2 receptors for design of inhibitors with improved activities. Most of available experimental data information has been used as training set to derive optimized and fully cross-validated eight mono-probe and a multi-probe quantitative models. Notable is the use of 262 molecules, aligned following both structure-based and ligand-based protocols, as external test set confirming the 3-D QSAR models' predictive capability and their usefulness in design new VEGFR-2 inhibitors. From a survey on literature, this is the first generation of a wide-ranging computational medicinal chemistry application on VEGFR2 inhibitors. Journal of Medicinal Chemistry, 57 (12), pp. 5212-5225, 2014. A comparison of the effects of the 6-(2-chloro-6-fluorobenzyl)-2-(alkylthio)pyrimidin-4(3H)-ones (2-Cl-6-F-S-DABOs) 7–12 and the related 6-(2,6-difluorobenzyl) counterparts 13–15 in HIV-1 infected cells and in the HIV-1 reverse transcriptase (RT) assays is here described. The new 2-Cl-6-F-S-DABOs showed up to picomolar activity against wt HIV-1. Against clinically relevant HIV-1 mutants and in enzyme assays, the simultaneous C5(methyl)/C6(methyl/ethyl) substitution in the 2-Cl-6-F- and 2,6-F2-benzyl series furnished compounds with the highest, wide-spectrum inhibitory activity against HIV-1. Three representative 2-Cl-6-F-S-DABOs carrying two (9c, 10c) or one (10a) stereogenic centers were resolved into their individual stereoisomers and showed a significant diastereo- and enantioselectivity in HIV-1 inhibition, the highest antiviral activity well correlating with the R absolute configuration to the stereogenic center of the C6-benzylic position in both cellular and enzymatic tests. Application of previously reported COMBINEr protocol on 9c and 10c confirmed the influence of the stereogenic centers on their binding modes in the HIV-1 RT. Journal of Chemical Information and Modeling, 54 (3), pp. 970-977, 2014. Hsp90 continues to be an important target for pharmaceutical discovery. In this project, virtual screening (VS) for novel Hsp90 inhibitors was performed using a combination of Autodock and Surflex-Sim (LB) scoring functions with the predictive ability of 3-D QSAR models, previously generated with the 3-D QSAutogrid/R procedure. Extensive validation of both structure-based (SB) and ligand-based (LB), through realignments and cross-alignments, allowed the definition of LB and SB alignment rules. The mixed LB/SB protocol was applied to virtually screen potential Hsp90 inhibitors from the NCI Diversity Set composed of 1785 compounds. A selected ensemble of 80 compounds were biologically tested. Among these molecules, preliminary data yielded four derivatives exhibiting IC50 values ranging between 18 and 63 μM as hits for a subsequent medicinal chemistry optimization procedure. Journal of Chemical Information and Modeling, 54 (3), pp. 956-969, 2014. Sapienza University of Rome, 2014. The present doctoral thesis is the result of the work carried out during the three years of my PhD scholarship at the Rome Center for Molecular Design laboratory (RCMD, Department of Chemistry and Drug Technologies, Sapienza University of Rome), under the supervision of Prof. Rino Ragno. The research activity was focused mainly on the design, optimization and application of computational strategies to derive quantitative structure-activity relationships (QSAR, 3-D QSAR, and COMBINE) on different molecular classes of current interest, such as: opioid receptor antagonists (OPAs), Hepatitis C Virus NS5B-Polymerase Inhibitors (NS5B-NNIs), Hystone Deacetylase Inhibitors (HDACIs), Anti- tubercular agents, vascular endothelial growth factor receptor-2 (VEGFR-2) inhibitors, HSP90 inhibitors, HIV-1 reverse transcriptase inhibitors (NNRTIs), Bovine Serum Amine Oxidase (BSAO) substrates, etc... Moreover two research periods abroad were performed: the first framed in a LLP Erasmus program collaboration, was conducted for six months at the Laboratoire d'Ingénierie et Moléculaire Pharmacologique Biochimie (LIMBP) of the Université de Lorraine Metz (France), directed by Prof. Gilbert Kirsch, and characterized by the application of organic synthesis to obtain new thienopyrimidinone derivatives as potential inhibitors of vascular endothelial growth factor receptor-2 (VEGFR-2); the second took place, for three months, at the Department of Biochemistry and Molecular Biophysics in Washington University School of Medicine in Saint Louis (MO, USA), under the supervision of Prof. Garland R. Marshall, investigating the activity profile of new Histone Deacetylases (HDACs) inhibitors by the application of the Mobility Shift Assay Technology. Main purpose of this doctoral thesis is to highlight the activities carried out in the different research projects, the applied methodologies and the obtained results. The text starts describing those studies whose results were published in scientific journals (chapters I-VI): the author decided to omit some procedural details, completely reported in the published papers, that would make the text too long, tedious and redundant; therefore readers who want to delve these aspects can also refer to Chapter XII in which is possible to read the original papers; on the contrary for studies that have not yet been published, as those characterizing the Chapters VII and VIII, discussion is adequately detailed. Chapters IX and X report the scientific activities carried out in France and in USA respectively; Chapter XI summarizes all the scientific activities accomplished during the entire PhD course, whereas Chapter XII, as mentioned, contains the published articles. 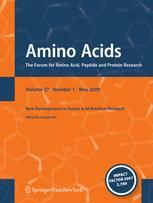 Amino Acids, 45 (3), 2013.
assayed polyamine analogs in order to clarify their binding modes. Journal of Chemical Information and Modeling, 52 (8), pp. 2215-2235, 2012. An enhanced version of comparative binding energy (COMBINE) analysis, named COMBINEr, based on both ligand-based and structure-based alignments has been used to build several 3-D QSAR models for the eleven human zinc-based histone deacetylases (HDACs). When faced with an abundance of data from diverse structure–activity sources, choosing the best paradigm for an integrative analysis is difficult. A common example from studies on enzyme–inhibitors is the abundance of crystal structures characterized by diverse ligands complexed with different enzyme isoforms. A novel comprehensive tool for data mining on such inhomogeneous set of structure–activity data was developed based on the original approach of Ortiz, Gago, and Wade, and applied to predict HDAC inhibitors’ isoform selectivity. The COMBINEr approach (apart from the AMBER programs) has been developed to use only software freely available to academics. Journal of Medicinal Chemistry, 55 (7), pp. 3558-3562, 2012. The single enantiomers of two pyrimidine-based HIV-1 non-nucleoside reverse transcriptase inhibitors, 1 (MC1501) and 2 (MC2082), were tested in both cellular and enzyme assays. In general, the R forms were more potent than their S counterparts and racemates and (R)-2 was more efficient than (R)-1 and the reference compounds, with some exceptions. Interestingly, (R)-2 displayed a faster binding to K103N RT with respect to WT RT, while (R)-1 showed the opposite behavior.